SleepRight Side Sleeping Pillow from HealthyKin.com provides maximum support and superior comfort for the head, neck, and shoulders so you can expect restful sleep. Sleep studies indicate that side sleeping habits are 95% more prevalent when compared to sleeping on the back. Orthopedically correct side sleeping posture is now made possible by the latest in sleep technology with the SleepRight Side Sleeping Foam Pillow. 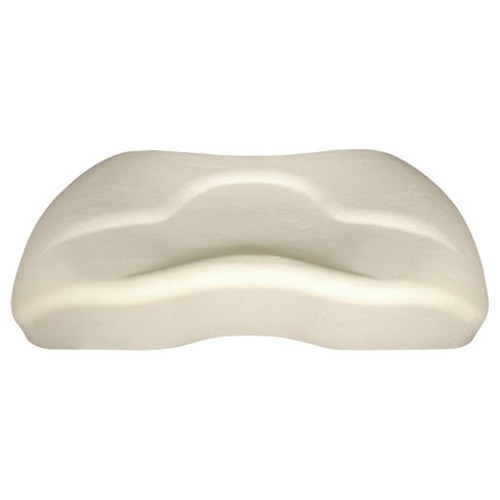 The SleepRight Side Sleeping Foam Pillow is made from premium Visco-elastic memory foam, originally developed by NASA. This pressure relieving memory foam is sensitive to body temperature and weight, easily conforming to your own personal anatomy. 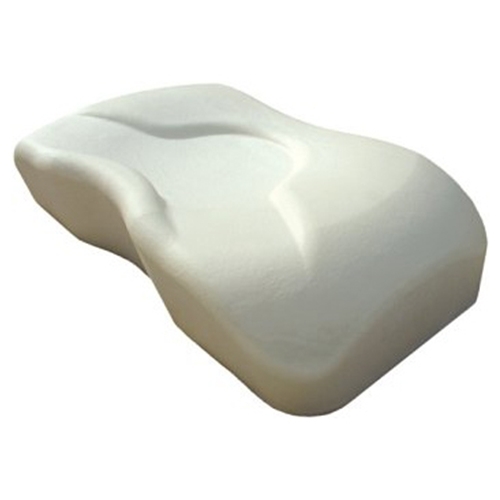 We guarantee our foam pillow to be made of the highest quality memory foam available with a 5-year warranty. Includes a machine washable, hypo-allergenic, cotton velour cover. However, if desired, your favorite standard pillowcase provides a nice feel without the velour cover. The Visco-elastic memory foam pillow conforms to your facial contours by taking an impression of your head and neck anatomy. This greatly minimizes the unwanted side effects of pressure points, which is a benefit unavailable in regular pillows. As your head settles into the full facial cradle, the memory foam pillow will softly conform to your personal anatomy. The memory foam will automatically adjust to your body temperature and head weight as your head and neck stabilize in its resting place. When equalization between head weight and the elasticity of the memory foam pillow is achieved, your head and neck posture will be ideally aligned with your spinal column. I toss and turn all night. Sleep mostly on my right side. Have had many expensive neck pillows. They just get flat over the years. I am 6'1 so I have to have a thick pillow. The first night I used it I did not wake up with my neck hurting. I see a upper cervical chiropractic a long time ago he recommended these special pillows. This is the best one I have gotten and the best price. Size is important, so make sure you get the right size you cannot exchange it here, but can on the company site for twice the price. I have purchased many pillows over the last 10 years. This is by far the best I have ever had. I am so pleased with it. I was having shoulder and back pain prior to switching to this pillow. Now I am pain free. I've tried too many pillows to count in an effort to relieve my neck pain. This pillow is by far the best as the other pillows were too low and caused more pain. I am very happy with this purchase! Works very well to restrict my head movement. It's also very soft compared to other cervical pillows so it "gives." I am recovering from a C6/7 pinched nerve and I have been sleeping better ever since I got this pillow. 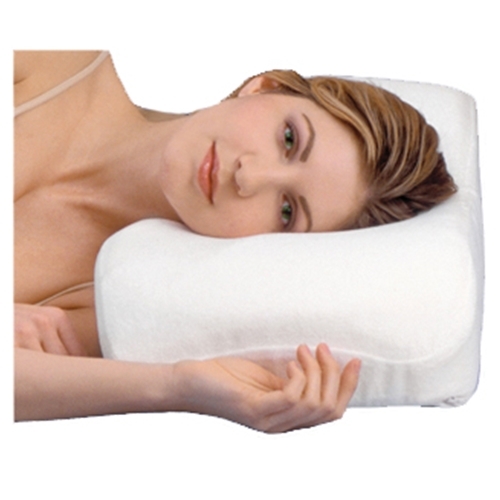 Was having neck pains and purchased SleepRight Side Sleeping Pillow. Have had it for over two weeks now and neck pain has subsided. Was so happy with it I purchased one for my wife who is also very pleased with hers. One item to note is that this pillow is much firmer than any feather or fiber filled pillow I have used in the past. It takes a couple of nights to get used to the extra firmness, but the extra support it provides is well worth it. Be sure to use the sizing for max benefit. Also, I shopped all over the internet and the Healthkin price was the cheapest I found. Delivery was prompt. Can't imagine trying to sleep without our SleepRight Side Sleeping Pillow, whenever possible bring it along when we travel. This pillow is great. I've had chronic neck problems and see a chiropractor regularly, this helps greatly. Takes several nights to get used to it. Im petite (5'1") so ordered the travel size. Best price on the market. I enjoy the pillow. Purchased my wife and sister each a pillow. The pillow fits quite will with my CPAP mask. My mask stays in place so much better. This is an awesome pillow! I'm a side-sleeper. I tried using a conventional pillow. Headaches were constant. I slept so well from the very first night on. I think the pillow is a little pricey but not compared to a good nights sleep. Hurray!